This is a breakfast item made from jackfruit flesh/pulp. This dosa comes out best with tilvo panas (the soft slimy variety of jackfruit). This dosa is different than the regular ones in that its thick and sweet and does not really need a side/chutney. Its a common dish in konkani homes. Its very quick and easy to make provided you have jackfruit on hand. 1. Blend the jackfruit slices (flesh) and the jaggery together in a mixie. 2. To the above blended mixture, add coconut, rava, salt, wheat flour and mix well. Add water to adjust this batter to a thick consistency. 3. Let the mixture rest for about 15 mins. 4. On a heated cast iron tava with low flame, spread little oil and pour a ladle full of the batter. Spread into a thick circle. Put a few drops of oil on the top of the mixture only. 5. Once the top side looks slightly dry, turn the bhakri/dosa over and cook the other side on medium high flame for few minutes only. 6. For all remaining dosas, no need to grease tava again with oil. Directly pour and spread batter and pour few drops only on the spread batter. 7. 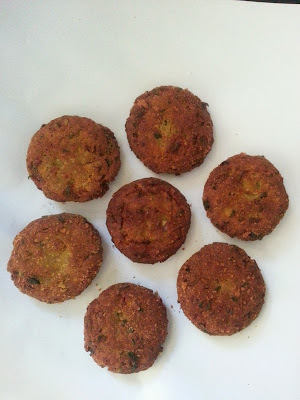 Serve hot with ghee/chutney powder/coconut chutney. This can be eaten without a side actually and does not need anything else. 1. 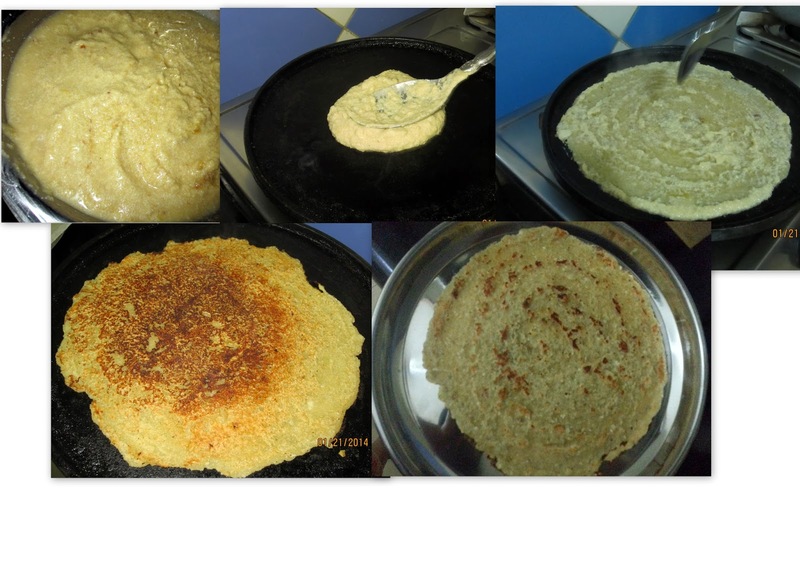 Both sides of the dosa should not brown too much. 2. Wheat flour can be omitted totally. Wheat flour helps bind and avoids the dosa from breaking so is used. 3. This batter should not be runny. It should be thicker than dosa batter. 4. To store jackfruit slices for a later time, boil the jackfruit slices with jaggery. To do this, you need to keep stirring, else it will stick to the bottom of the pan. Once the whole mixture boils and forms a syrupy consistency, switch off the heat. Cool this mixture and store in air tight container in freezer. Thaw when ready to use. If using this, blend the thawed mixture alone with very little jaggery only. Boneless chicken pieces - 1/2 lb. - Heat oil in a pan, add the cumin seeds, fennel seeds, curry leaves and the whole garam masala. Once they sizzle, add the onions and fry till light brown. Add the ginger garlic paste and saute till raw smell goes away. - Add the tomato puree and fry till oil starts oozing out. Add the red chilli powder, turmeric powder, kolhapuri masala and salt and mix well. 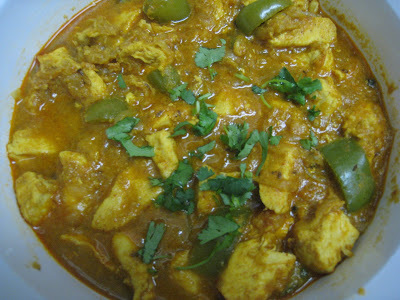 - Add the chicken pieces, grated coconut and the bell pepper pieces and mix everything together. Add 1/2 cup of water, cover and cook on medium flame with occassional stirring till done. 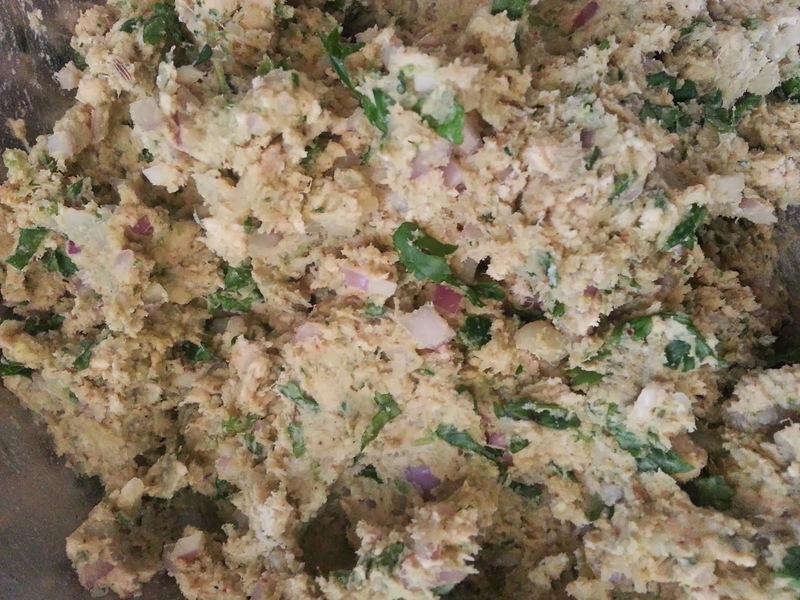 - Add chopped cilantro and serve hot with rotis or rice. Boneless Chicken cut into small chunks - 500 gms approx. 1. Marinate the cut chicken pieces with salt and red chilli powder for about 30 minutes. Then pressure cook this chicken with little water for 1 whistle. 2. Once cooled break/chop the chicken into smaller pieces and pulse in mixer till it gets minced. Do not use any of the water from the boiled chicken. 3. Grind the ginger, garlic, green chillies, cinnamon sticks, cloves, pepper corns, fennel seeds, a few of the coriander leaves together without adding any water. 4. 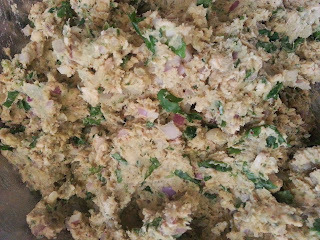 Now mix the minced chicken, mashed potatoes, the ground mixture above, chopped onions, remaining cilantro, mint, garam masala, chaat masala, turmeric powder and salt and mix. 5. Add one raw egg to the above and mix well. It should be quite a dry mixture. If you feel its too sticky, add a few bread crumbs to it and mix. 6. Take a little mixture at a time, shape into cutlets, roll in the bread crumbs and deep fry in oil. 7. Serve hot with ketchup or hot sauce. Notes: More vegetables like grated carrot, capsicum, cabbage can be added for different variations. All text and photographs are copyright of Konkan World, unless otherwise noted.Please DO NOT reproduce without permission.